The legend confronts mythology and manages to produce a very compelling album while solving a few existential crises along the way. Pity poor Black Francis: all resurrected and nowhere to go. After spending over a decade repressed in the murky depths of Charles Thompson's psyche, having to watch his less manic alter-alter ego Frank Black explore things like traditional song forms and roots rock, the darkly creative persona was once again loosed on the world for the 2004 Pixies reunion. Hopes were high on both sides of the proscenium that his reemergence would result in a new surge of material that might match the classic albums now ensconced in underground rock legend. Now, however, with the initial excitement dissipated and word that the band's cynical-adversarial bass player has put the kibosh on any attempt to duplicate past glories, Black Francis is adrift, unmoored and in search of place. What is Black Francis? That seems to be the underlying theme of his post-reunion work. On 2007's Bluefinger, the nom-de-plume explores the life of artist Herman Brood, a raucous Dutchman who lived an intense lifestyle of drugs, danger, and art which culminated in his suicidal leap from the roof of the Amsterdam Hilton Hotel in 2001. The album also depicts what seems to be a struggle between Black Francis, whom the music is credited to, and Frank Black, whose sound is still quite discernable even as shards of Pixie-like swagger creep in. Bluefinger is a meta-narrative, juxtaposing the story of an artist who burned out with a persona that simply faded away, coyly inviting the listener to wonder what the effects of creating a personality might be, what happens when the image becomes the artist, and whether there's any way to avoid the confused demands and expectations of the audience. Svn Fngrs continues this dialogue; rightfully so, as it was undertaken as a tangent of Bluefinger. But instead of focusing on the tragic story of a real person, Black Francis delves into legend. The songs on Svn Fngrs concern distant, unfathomable figures who, thanks to large expanses of time and the exaggerations of devotees, have gained reputations far beyond that of mere mortals. Sound familiar? Can legend be lived up to? Would King Arthur or Cúchulainn, the Irish hero for whom Svn Fngrs is titled, seem so special, so impressive if they were to reappear in modern times? Does Black Francis? This mini-album is awash in existential crisis. It's a musing on what it means to be legendary, when the persona that surrounds you is no longer under your control but is instead defined by the world around you and if it's even possible to be yourself and do what you please when others expect so much. The result is touching, enjoyable, and occasionally heartbreaking. The Black Francis of Svn Fngrs isn't the same man who bleated out free-associative dada lyrics on Doolittle. These songs are tighter, more measured, more self-aware. It's a matured perspective that might put off listeners who hoped Black Francis would emerge from his hibernation untouched, but nonetheless is pleasurable, mixing twinges of nostalgia with forward-thinking introspection. "Garbage Heap" sounds the most like a Pixies song, a lost Bossanova b-side perhaps, with a soaring melodic chorus that surfs along a rising wave. The bending, twisting lead guitar that snakes through the song and chugging rhythmic wall immediately recalls those early '90s sounds. It stands out as kind of a "this is what could have been" moment on Svn Fngrs, had the Pixies reunion birthed a new LP. 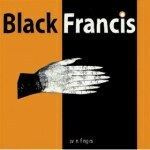 "Half Man" and "Seven Fingers" are the real guts of this mini-album, clearly communicating the thematic concern that Black Francis has for himself. "Don't blame me because," he sings on "Half Man," "Don't blame me 'cause hey, I'm only human." The song, literally, seems to be about the atomic bomb, perhaps from the perspective of a crewman of the USS Indianapolis which delivered the "Little Boy" bomb to the Tinian Island airbase for pickup and deployment. "Seven Fingers" is from the perspective of the aforementioned Cúchulainn, explicitly struggling to reconcile his fearsome heroic legend with a tender, emotive private pain. Set apart from others by his digital deformities, Cúchulainn sounds resigned to his fate, indulging in a single night of peace but unable to escape the death and destruction that lie ahead. Svn Fngrs is more than just a battle with personal mythology, though. It's a damn fine album, with some of the most compelling music Charles Thompson has made under any of his many names. The meaningful, well-crafted lyrics and simple yet layered arrangements make each song a treasure trove of little pleasures, each begging to be dissected and interpreted. That it's only a seven song mini-album isn't a cause for disappointment, in fact it's somewhat refreshing after years of seemingly unceasing, unedited output from Frank Black. Here's hoping that Black Francis has found his place in a Pixie-less world and that he's able to continue adding to his already heavy legend.